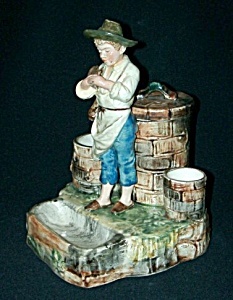 This wonderful Young Boy Holding a Boot Figural Humidor is 8" tall. Incised on the bottom is, "2461 42". It has match holder with striker, humidor with lid, wasted match holder, and pipe holder/ashtray. It is an original - NOT a reproduction! The condition is very good to excellent - having no cracks (or hairlines), chips or repairs. "Click" on the photo to the left to see an enlargement and any other photos we may have of this piece of majolica. Please use the "Ask A Question" button to the right if you have any questions concerning this item and remember - all sales are fully guaranteed!